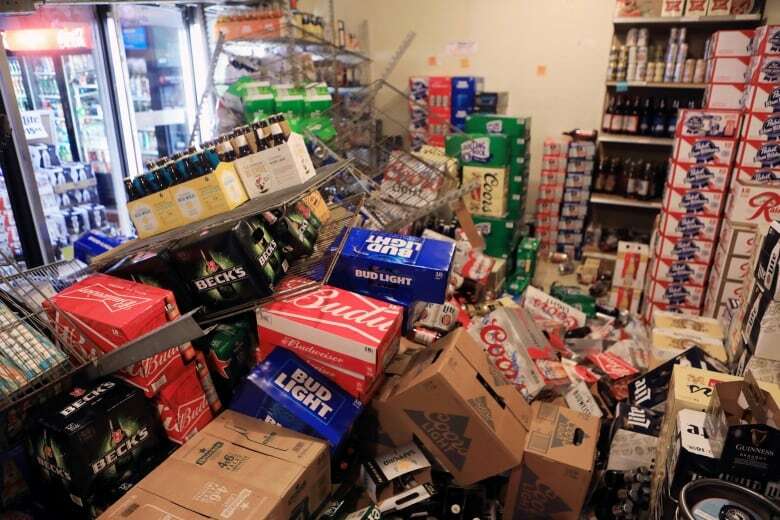 Back-to-back earthquakes measuring 7.0 and 5.7 rocked buildings and shattered roads Friday morning in Anchorage, sending people running into the streets and briefly triggering a tsunami warning. No tsunami arrived, and there were no immediate reports of deaths or serious injuries. 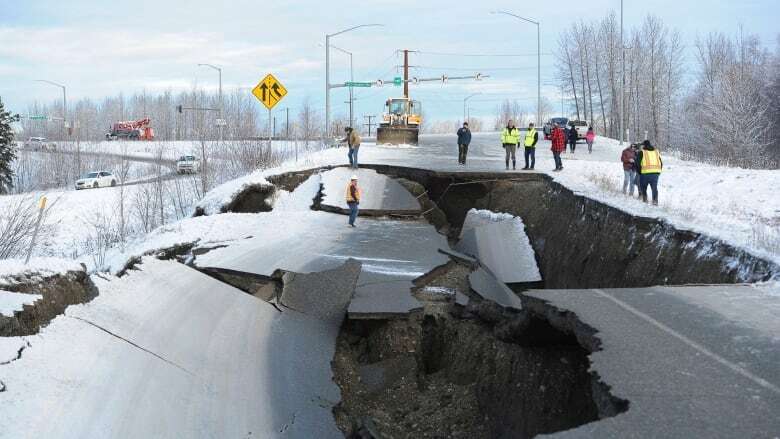 The U.S. Geological Survey said the first and more powerful quake was centred about 12 kilometres north of Anchorage, Alaska's largest city, with a population of about 300,000. People ran from their offices or took cover under desks. The 5.7 aftershock arrived within minutes, followed by a series of smaller quakes. 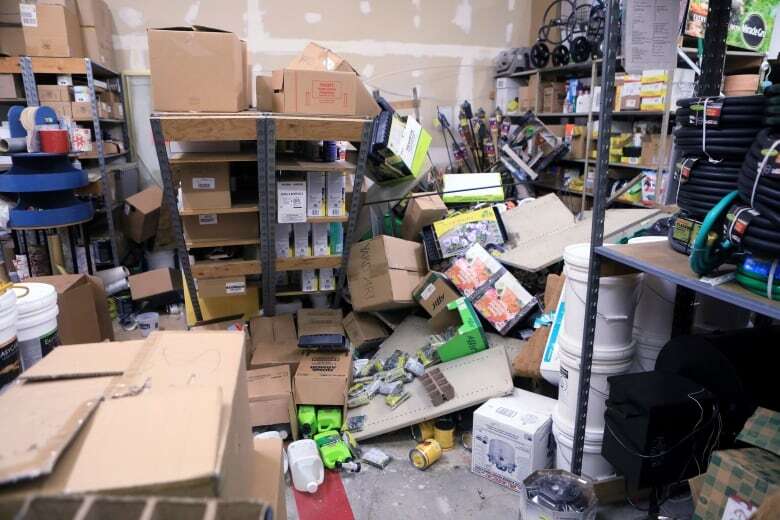 The quake broke store windows, knocked items off shelves, opened cracks in a two-storey building downtown, disrupted electrical service and disabled traffic lights, snarling traffic. It also threw a full-grown man out of his bathtub. 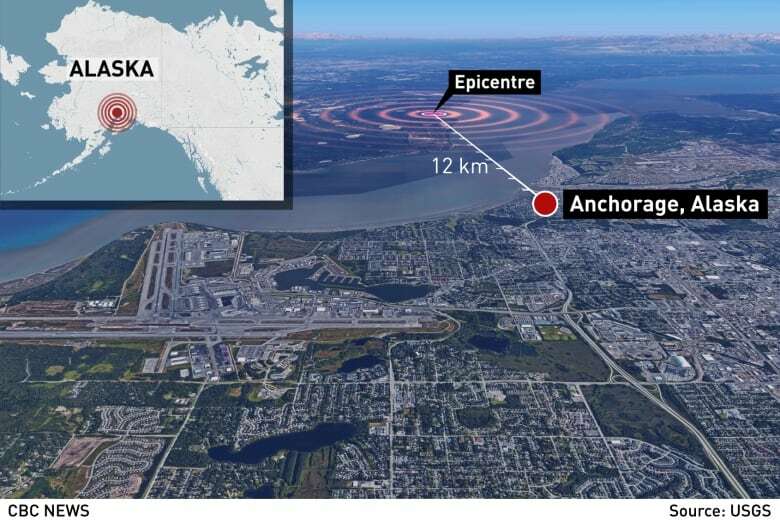 The U.S. Geological Survey said the first and more powerful quake was centred about 12 kilometres north of Anchorage, Alaska's largest city, with a population of about 300,000. Flights at the airport were suspended for hours after the quake knocked out telephones and forced the evacuation of the control tower. And the 1,287-kilometre Alaska oil pipeline was shut down while crews were sent to inspect it for damage. Anchorage's school system cancelled classes and asked parents to pick up their children while it examined buildings for gas leaks or other damage. 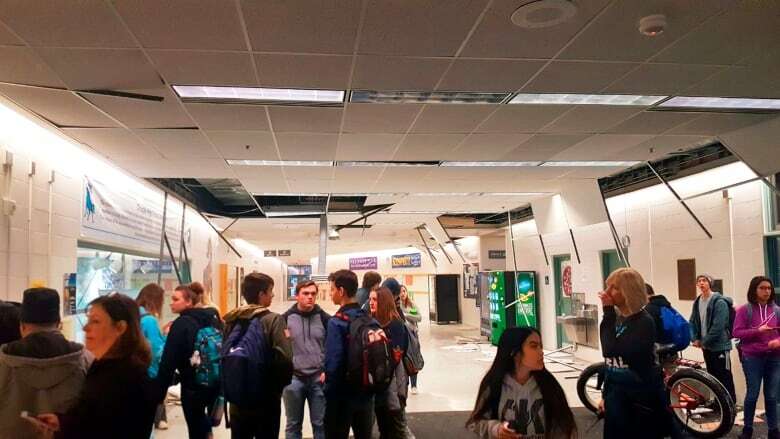 Fifteen-year-old Sadie Blake and other members of the Homer High School wrestling team were at an Anchorage school gymnasium waiting for a tournament to start when the bleachers started rocking "like crazy" and the lights went out. People started running down the bleachers in the dark, trying to get out. Jonathan Lettow was waiting with his five-year-old daughter and other children for a school bus near their home in Wasilla when the quake struck. The children got on the ground while Lettow tried to keep them calm. "It's one of those things where in your head you think, 'OK, it's going to stop,' and you say that to yourself so many times in your head that finally you think, 'OK, maybe this isn't going to stop,"' he said. Former Alaska governor Sarah Palin tweeted that her home was damaged: "Our family is intact — house is not. I imagine that's the case for many, many others." She posted a video of the inside of her parents' home, with broken dishes littering the kitchen floor. A large set of antlers appeared to have fallen off a wall of the living room. Alaska was the site of the most powerful earthquake ever recorded in the U.S. The 9.2-magnitude quake on March 27, 1964, was centred about 120 kilometres east of Anchorage. It and the tsunami it triggered claimed about 130 lives.